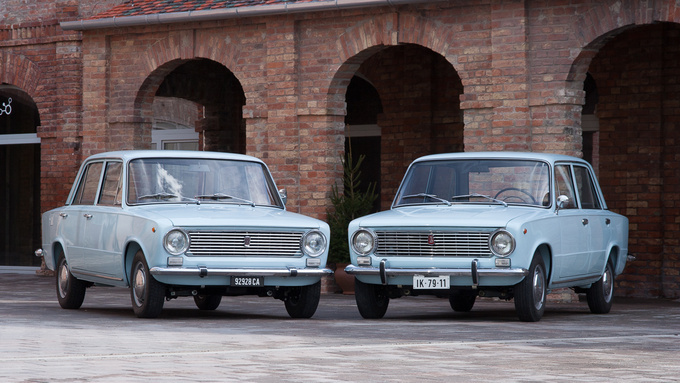 Totalcar Magazine - Classic and Beloved - Was the original Fiat better than the Lada? Let's put this straight. Fiat devised its 124 model in the middle of the 60's, presented it to the public in 1966 and won the European Car of the Year award in 1967 with it. It was an acceptably good car according to the press, albeit a bit old-fashioned in design with its pushrod engine, its live-axle rear suspension, worm and nut steering box and three-box architecture. The Soviet government was on a mission at the end of the 60's to find the base for an ideal people's car, something that was more modern, needed less attention, was easier to produce and lasted longer than the horrible Moskvitch 408/412 that, in theory at least, had been intended to become the Russian car for the masses at an earlier stage of decision-making. They tested something like a dozen promising cars out of what Western Europe could offer but they all fell to pieces on Russia's zillion potholes. 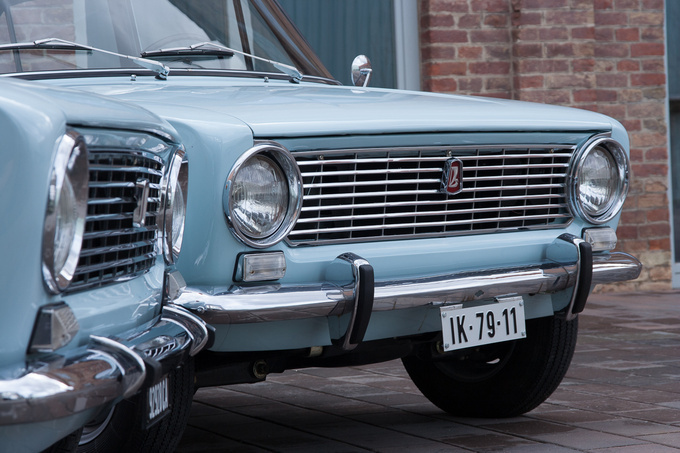 The one that lasted the longest was the Fiat 124, so the Soviet government signed a deal with Fiat that the car would be redesigned for the harsh conditions and then they would get the license to produce it. Out went the fragile rear axle and a massive housing replaced it. Gone were the rear disk brakes too, big drums took their places. 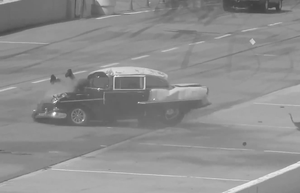 Lots of other minor and not so minor modifications were made but the biggest one concerned the engine. Whilst the early (and basic-spec) Fiat 124 had a pushrod (OHV) engine derived from the old Fiat 1300/1500 series, the Shiguli, or the Lada 1200 by its export name (and VAZ-2101 according to the factory code system) received a modern, Fiat-designed overhead camshaft block (OHC) fresh out of the box. As far as we know this engine had been developed earlier for a smaller Fiat off-roader that would have been sold alongside the Campagnola but ultimately it never reached production. 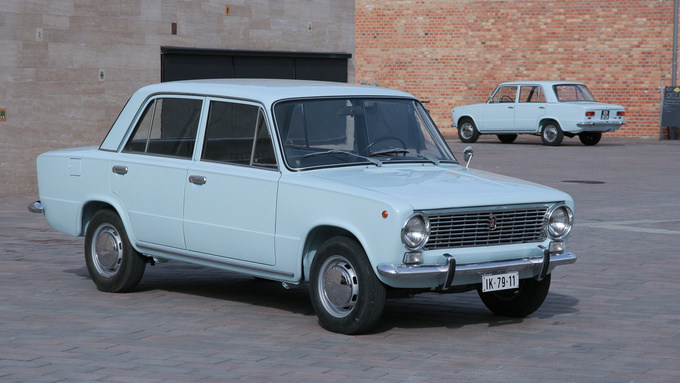 The final, heavily-modified, Russian version of the Fiat, called the 124R, was doing its test rounds by 1968, while its production started in 1970. In the end the Italian government gave a huge loan to the Russians so that they could start the business. Fiat in turn erected the largest and most modern factory in Europe at a new setting for free. They even built a complete city around it and called the spot Togliatti after an Italian Communist hero. Of course there was lots of politics involved and in the end it was Fiat and the Italian government making a huge profit on this deal. But there's one more twist to this story. As a part of the agreement the Russians supplied almost all the steel that Italian cars were built from in the 70's and 80's, and this steel was of neither high quality nor was it protected by any means while transported. If you consider that all Italian cars – be it a humble Fiat 127 or Alfasud or an expensive Ferrari 512 or even a mighty De Tomaso Pantera – from that era turned into heaps of iron oxide in the first six weeks of their service time, it cannot be said for certain that it was the Italians wearing the biggest smile on their faces when they looked back on this Lada-deal. You can find various negative and some positive reviews about Ladas in magazines but one thing is rarely told: the original Shiguli became the biggest turning point in the car business of the Soviet-allied part of the world. Before the Lada, cars were just trickling off the old production lines in COMECON countries, but when the factory in Togliatti got under full steam and started pouring Shigulis in three shifts (roughly from the end of 1971), there was a promise that everybody in the Eastern Bloc who craved for a new car would soon be able to get one for real. The Lada wasn't cheap but with some struggle and careful saving it could be bought by many. It proved to be way more sturdy, much more rust-proof (don't laugh, the others were even worse), more frugal on petrol (again this is against the contemporary contenders) than all the rest that was on offer. It was also found to be acceptably spacious, quick, easy to drive. Huge masses of these cars were produced and parts could be obtained for them when they broke down which seemed to be magic in Hungary or in fact, in any other Eastern Bloc country in those times. The Lada 1200 may have been the cheapest usable car on offer in Western Europe but on the other side of the Iron Curtain it became the top-level private transport anybody could afford. Of course there were huge fluctuations in build quality. Early cars dating from 1970-72 are generally considered the best of the breed, with a slight drop in quality afterwards. Better cars came again in 1973-74 but then everything went sour. By the middle of the 80's those late cars were faint memories of the early editions. And as usual, there were the self-taught professionals who had the answers for the decline: the early cars had more Fiat-parts in them. Which is funny, because in Hungary most petrol-heads thought of Fiats as the 'discounted Western cars' in those years. Before the Ladas went on sale, a few original Fiat 124's also seeped into Hungary, a handful of them even ran as taxis. I remember those from my early childhood: they were the 'strange Shigulis' with unusual over-riders on their bumpers and weird handles on their doors. I loved these Italian Ladas because they didn't bring visions of the Komsomol – the youth organization of the Party – and the Red Square into my mind, instead they conjured pictures from Bud Spencer and Nina Lollobrigida movies. 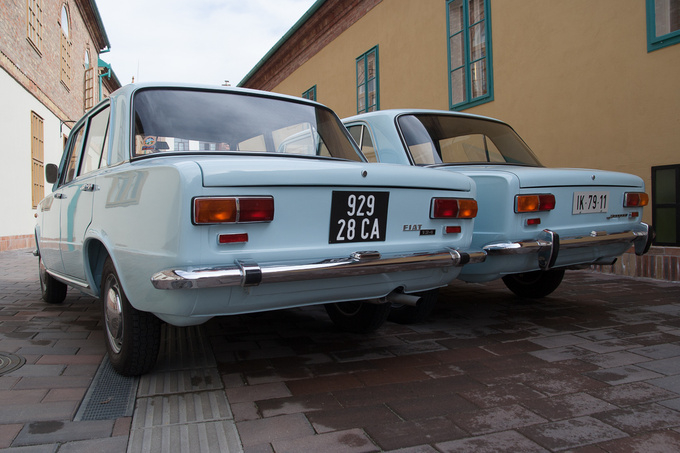 People who drove these Fiat 124's said that they were much more nimble cars with higher revving engines and better brakes than their Russian counterparts. And as we know by now – all major components were unique to the Lada and they weren't ever produced in Italy, although some of the stampings wore FIAT logos in them. But let's leave the past rest, because the present beholds two beautiful cars for us to sample. One of them is a Shiguli 1200 from 1971, the first full year of production. 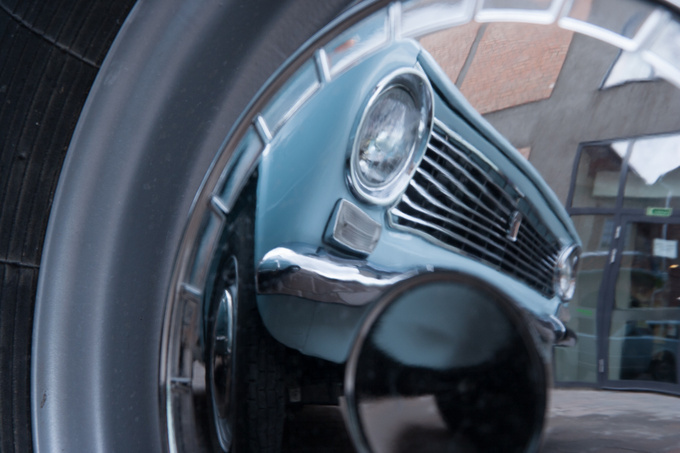 These early Ladas can be spotted by the chrome-plated half moon trims between the headlight and the grille. The other car is even more of a rarity: it is one of the earliest Fiat 124's that was made, it rolled off the line in early 1966. 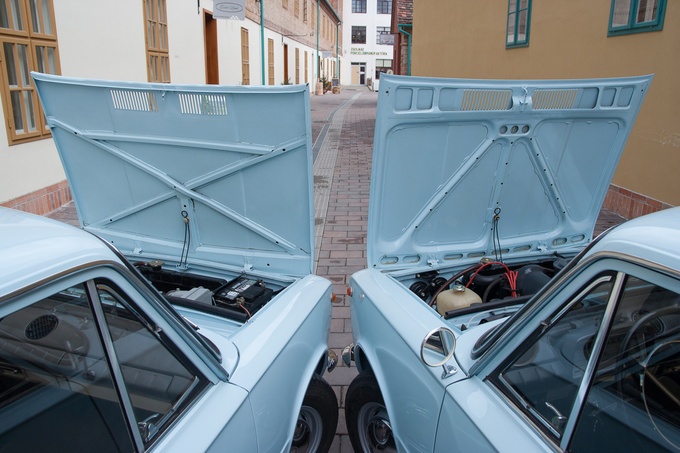 Both of them are powder blue, immaculate from outside, original in their mechanics down to their nearly untouched interiors. Time has really been kind to the simple design of the 124. What was once a 'let's play things on the safe side' shape at its inception – balancing on the verge of being boring by the 80's – is just a nice, clean, uncluttered design today with just a little hint of Italianate sportiness to its stance. Three things really help us to see them in the best light: the colour, the originality and the license plates which resemble, but don't exactly copy the originals. I've been waiting for this comparison probably since I first realized that there is an Italian and a Russian version to this car, which makes it about 40-plus years of speculating. Is the more fragile original version, with the older engine but more advanced brakes better than the massive Russky copy? Owners from the good old times say that the 124 could do 170kph on a good day but the heck, those early Shigulis were also said to be capable of 165... But the brakes were stronger, the steering was lighter in the Fiat according to the memories of all. I'd like to add that almost nobody drove Fiat 124's by the end of the 70's, while those Lada 1200's that were produced in the 80's – the ones with incredibly bad brakes, weak engines and unbelievably heavy steering systems – are still being used in big numbers in Hungary. 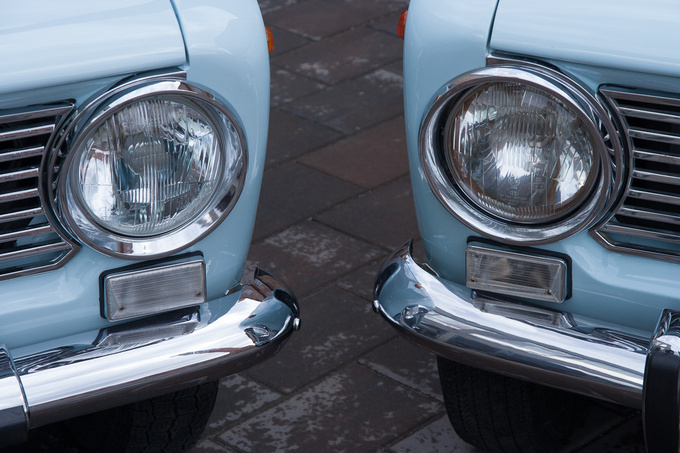 There is just a small chance that a one-on-one comparison of two early examples of both cars might show up less difference than anyone would believe. Each car came as a courtesy of a Lada collector, Attila Vukmann in Pécs (this is the south-western part of Hungary) to the test. The Fiat was bought in Tarvisio, Italy in 2012 in a well-preserved state and after some body repairs, a new paint-job and a brush-up of the mechanics it looks the part, although it still needs some more fettling with the engine, the owner admits. He has had the Lada for a bit longer – that one wasn't too bad either when he bought it, it also had a new paint job, some mechanical overhaul and that's it. In theory an overhead camshaft engine revs more freely than one with a pushrod valve train, because there are less alternating parts in it. But the Fiat belies this belief; even with its carburettor needing adjustment it hunts for those last hundreds of rpm's a bit more eagerly but in turn, doesn't pull with as much vigor lower down the range. Yes, the engine with the more old-fashioned construction is also the sportier and I'm talking about the Fiat here. I firmly believe that with just a bit of work the gap would become even wider. The Fiat also has got a more masculine, baritone sound, although the noise characteristics of the two cars are nearly indiscernible. The Lada has the typical buzz that sounds like a thousand king bees trying to free themselves from a metal bucket – this comes from the long timing chain one would think. But the Fiat's engine emits a very similar noise although it's got just a very short chain and those pushrods. An explanation is waiting. But there's no arguing about this: the Fiat's road holding is better, its wheels track road irregularities with better sensitivity, in corners there is less lean, too. But the brakes are plain worse in spite of its four disks in face of the cheaper disk-drum setup of the Lada. 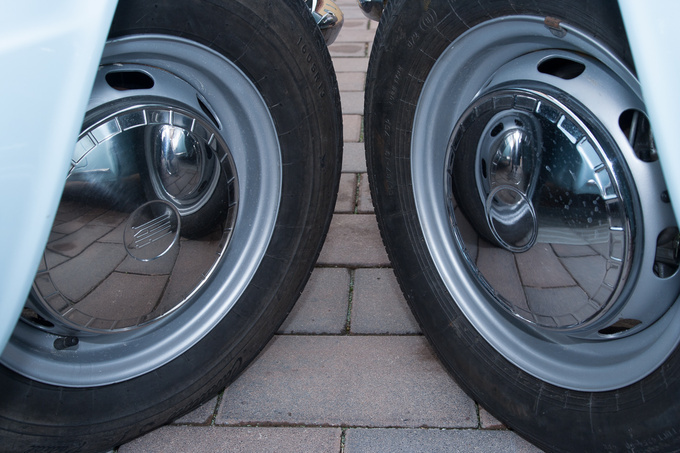 The explanation is easy: drum brakes at the time weren't necessarily less effective than disks, it was because of their better resistance to fading and locking up that they gained ground. And let's not forget: while neither one of these have a servo assistance (that only came with the bigger models at both makes) the Russian car at least has a dual-circuit system making it a bit safer. What both of these cars have is an exemplary gear shifting action – short on throw, exact in location, mechanical in feel. While clicking from speed to speed might cause delight, the gearing certainly won't: the overall ratio is incredibly short. Although these cars both are able to top 140kph according to their specifications and we know that their odometers are vastly exaggerating their real speed, still it almost hurts to push any one of them beyond 120 on the clock. Now, let's have a closer look on their technical solutions. The Lada is so extremely different from the Fiat at this level that we might think some aliens from outer space, who never saw the blueprints, did the copying of the 124. From the outside it is only the smaller over-riders on the bumpers, the grab-style door handles, the badge with the inscription and the marginally lower ride height gives the Italian car away. But then you notice that there is a Fiat sign on the hubcaps while there's nothing on the Lada's. The wipers are of Ar-To origin and there was never any space provided for an external mirror on the Fiat while the Lada has the original-spec round mirror on the edge of its door with its three-screw mounting. To be on the safe side Attila has attached an aftermarket mirror on the Fiat, too. But only the left one. He switched the lenses, order was restored in the world. The interiors hold similar surprises, too. 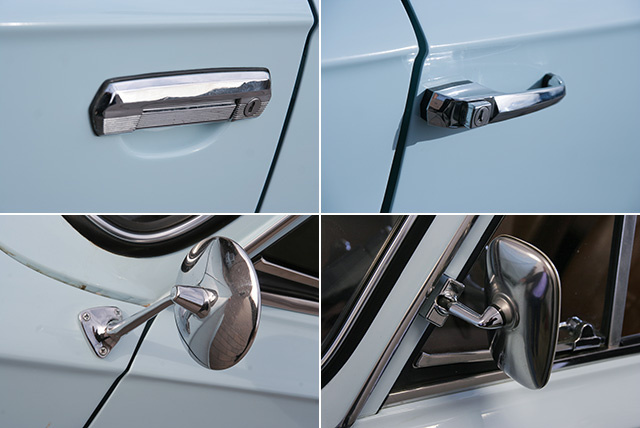 The door stops follow different logic, the one in the Fiat is also mounted lower on the A-pillar. 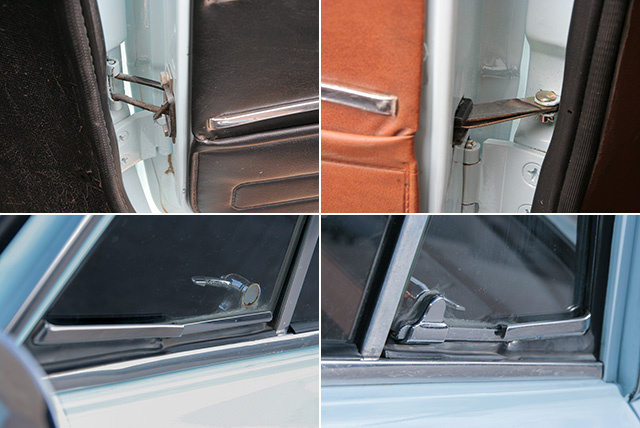 The armrests are brown in the Fiat, black in the Lada (as they always were in all the VAZ-2101's), the locks of the quarter lights on the front doors are mounted on the metal frame in the 124 but they are glued in the Lada. I can't see the reason for this modification – most of the Ladas were stolen in Hungary by melting the glue at the base of this lock with a lighter. Inside all is same but all is different. In the Fiat the backrests of the seats cannot be tilted, the floor mat has a goose bump-like design. The gas pedal is wider at the base, the gear knob is brown and you won't find a temperature gauge in the Veglia Borletti instrument cluster, just a warning light in its place. The driver is derived of some other information too, compared to the Russian car. There is no warning light for the handbrake, nor is there one for low brake fluid level. But the most striking feature is the brown dashboard – this seems to be quite a unique find in the Fiat 124-world and is unheard of in Lada-circles. The item isn't in the finest state, although Attila has gone great lengths to obtain another one from Italy. Until he succeeds, he has to settle with this one which has been patched up at places. Some other items are the same but are on the opposite side compared to the other: the ashtray sits closer to the driver in the Fiat but the Russians seemed to like promoting culture more than smoking because in the Lada it is the radio that fits at hand. It is the same with the choke button: on the left in the Fiat, on the right in the Lada. There is one common wrong-sidedness in both cars: they carry their ignition switches on the left. The Fiat's is a confection item from the shelves of Marelli –being the same as the 850's or the late 500's. The Lada's is more complex, later design with a few more stops and a steering lock feature. The biggest awe comes after opening up the engine compartments. The bonnets are totally different, the bracing structure in the Fiat is something like that of a kit car's: it is made of square-section steel and the steel simply bends 90 degrees downwards at the edges. The Lada in turn has a more elegant form-pressed supporting structure and the metal at the edges is folded flush back in plane completely. And there are the engines. The Fiat's is much smaller at the top because of the space-saving pushrod technique; it is almost lost in the engine bay. The Lada's OHC unit sits proudly, taking up a lot of room. The former one has a twin-choke (the butterflies open at the same time) side-draught Solex, the latter a down-draught two-choke (only one butterfly valve operates at low loads with the other one opening at stronger acceleration or going uphill) Weber copy. 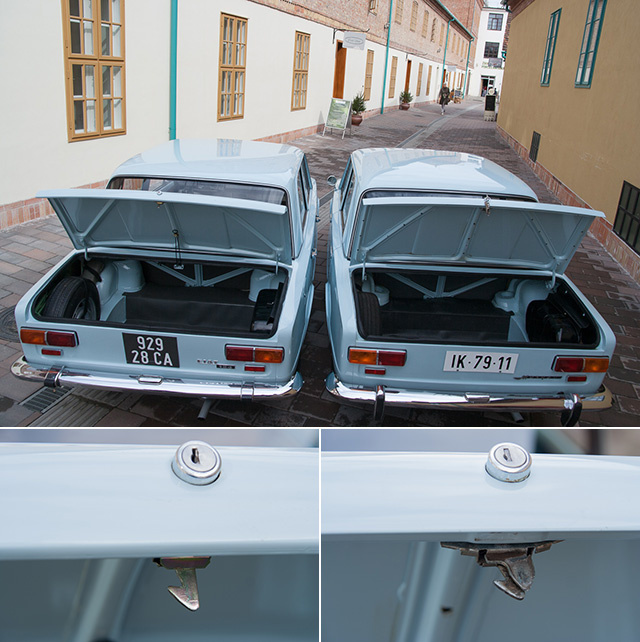 Even the horns are placed differently with diagonal cutouts in the Fiat, horizontal pair of holes in the Lada. Oh, and there's the equipment. The Fiat has got just the normal grey plastic box of essential tools that all Fiats had in the 60's and 70's but all the Ladas had a huge bag of specialized tools and even a pump in extra. One might say the designers were really prudent with that. And there's another difference that is difficult to explain: the jack of the Lada has a '124A100' pressing in it, the Fiat's jack is plain. Shouldn't it be the other way around? To see all the similarities and differences at the undersides we took the two cars to a repair shop (where they build Lada rally cars) and put them on professional jacks. Another problem here: the Lada has got four jacking points, the Fiat only two. So we had to lift the two on different devices. There aren't too many differences up front, both of the cars having double wishbone suspensions with coil springs and an anti-roll bar. The angles are a bit different, the arms of the steering linkage are bent in the Lada, straight in the Fiat and there's no sump protection under the Italian car's engine. The clutch is hydraulically operated in the Lada, but has a cable system in the Fiat – although you can hardly tell this by your left foot. The two pipes of the exhaust system come together in a Y-junction under the Fiat but meet in the first drum in the Lada. It couldn't have been solved the same way, since the Fiat does away with two mufflers while the Lada has got three. With this we can move to the rear end of each car. 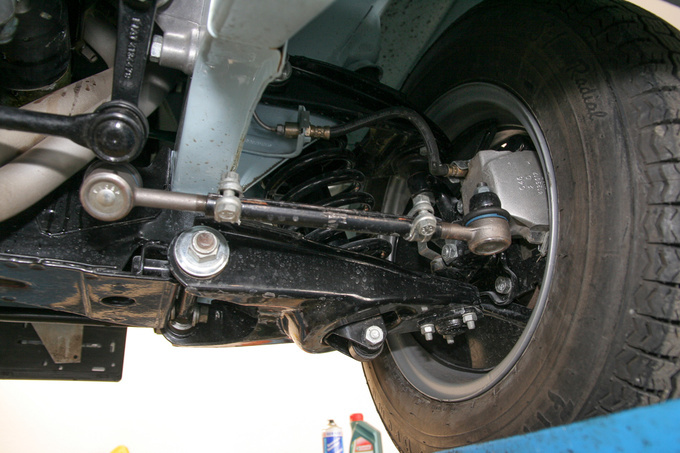 A live-axle setup was de rigeur at the time and the Fiat's was one of the more modern makers with not having leaf springing but utilizing coils and a transverse Panhard-rod to properly locate the whole business sideways. The Fiat's axle is much thinner, its Panhard-rod shorter and there's an anti-roll bar here, too – this all had been changed when the 124 was redesigned to become the Lada. There were also some modifications around the shock absorbers: they are concentric with the springs in the Fiat but have different angles and connecting points in the Lada. Because of this the latter also has got a bit more room in the boot, too. And then there's the much talked-about disk to drum backward evolution which, in fact, seems to have done no harm to the Lada: the Italian really has a nice looking brake system at the back, but the Lada's more down-to-earth drums are just as effective if not even better. So, which one is the better car? In theory the Fiat has more modern brakes, a finer suspension and because of its smaller weight a better power to weight ratio, too. In reality it is only the road-holding that really puts it above the Lada and the engine might also be said to be a marginally friendlier piece of equipment. The steering? It is heavy enough in both cars when parking, while it is sensitive and acceptably light at speed. And the Lada has received all the improvements that were later carried on to later Fiat 124's: the thermometer, the dual-circuit brake system, the seats with tilting backs, the steering lock and the OHC engine that was in fact, worse than the Fiat's in its original form because of its weight, unwillingness to rev and its higher consumption. But it had huge potential in it – look at the famous VFTS cars that Stasys Brundza was building in Lithuania for rallying. Those could never have been made out of the original 124-motor. This story is based on an article originally published in the Oldtimer & Youngtimer printed magazine that comes on sale every second month at the newsstands in Hungary.